Unlike today, it was quite common in the 19th century for public houses to be used for auctions and even Coroner's inquests. A house auction was held here at the Suffolk Arms on 31st May 1827, in the reign of George IV, but the Inn was actually built in 1824. The Suffolk Road was then known as Commercial Road and this hostelry was often referred to as a hotel. In 1828, the Inn was taken over by Anthony Major who advertised "well-aired beds and every accommodation for Commercial Gentlemen". He had replaced the earlier landlord, Mr Twining, and was himself soon replaced by John Thache, who only lasted until 1833. The lease often came up for renewal and landlords changed frequently. On Saturday 13th October 1836 the then landlord, Mr Stamford, had a dramatic riding accident and seems fortunate to have survived, as the accompanying newspaper report shows. ​By 1837, just a few months before Queen Victoria was crowned, the Inn changed hands and was taken over by Charles Scott, who advertised well-aired beds and good stabling for his guest's horses. He sold beer in glazed stoneware bottles, such as the one illustrated here, which was a porter bottle (photo courtesy of Steve Lawrey). The pub was advertised to let in 1850 and by 1851 Richard Bill became the landlord. A newspaper report of September 1853 concerns the sudden death of Mr Prinn, a coachman to a private house, whilst he played skittles in the grounds of the Suffolk Arms. Until the pub was refurbished in 2017 there was still an indoor skittles alley. ​By 1889 the landlord, Mr Dawes, was advertising Smoking Concerts at the Inn on Wednesday and Friday evenings in the winter season. Smoking concerts were popular in Victorian times and consisted of live performances, usually of music, before a men-only audience. The evening would include political discussion, whilst the men smoked and listened to the music. These events continued to be held at the Inn well into the 20th century. In April 1896 Edward Stephens, who claimed to be delivering milk to the Inn, was fined 10 shillings (50 pence) for not having proper control of his horse and cart. Apparently he had left the rig outside for half an hour without chaining the wheel to prevent the horse driving away. By far the longest serving licensee was Edward Simpson who was here from 1925-1955. In October 1939, with the outbreak of war and the fear of bombing raids, he was unfortunately fined 10 shillings for failing to obscure lights under the Defence Regulations. These matters were taken very seriously; just over a year later an air raid killed 23 people in Cheltenham and left 600 homeless. In August 1946 the Suffolk Arms held their first annual summer outing, with two coaches following a route through the Forest of Dean to Monmouth and Symonds Yat. Apparently a good time was had by all despite the wet weather. 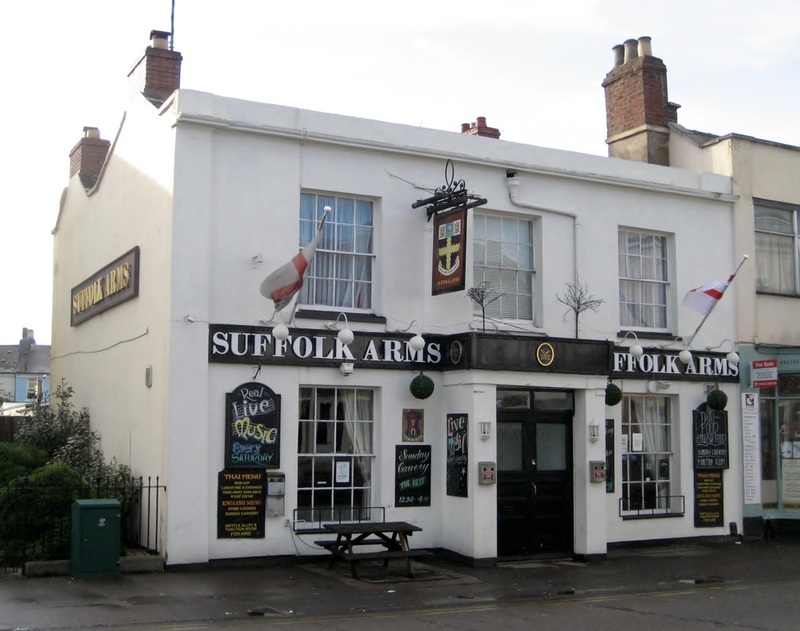 Click on this icon to download a list of many of the licensees of the Suffolk Arms. Public house tokens were widely used in Britain from about 1845 to 1914. They were typically made of brass and had a variety of uses. 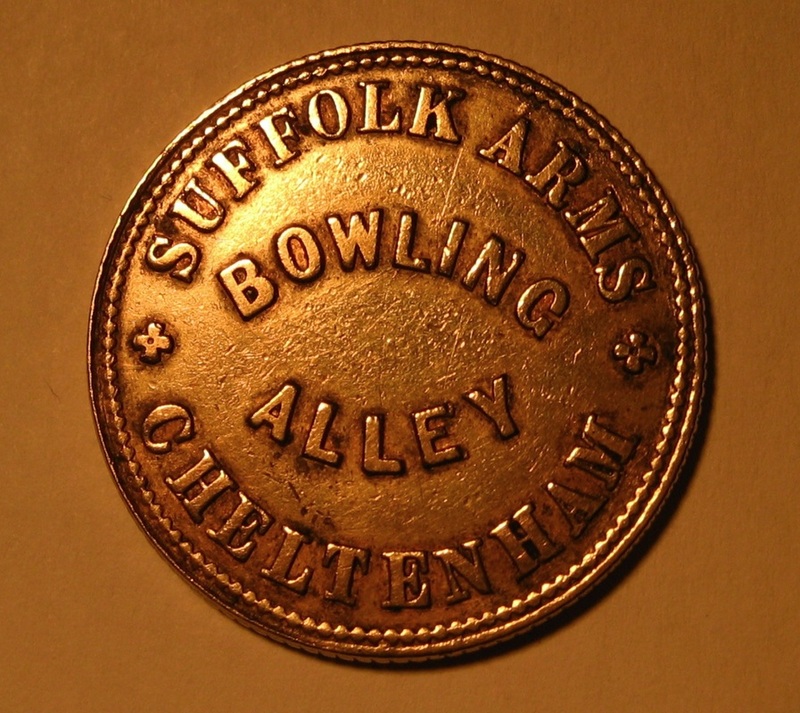 The one shown below was probably used at the Suffolk Arms to buy beer as a way of recompensing the landlord for the use of the skittles alley.